What Would You Get Through the Missionary Package? Are you a missionary (or a pastor) and want to build your speaking platform for when you are on furlough or get more speaking engagements as a Pastor? 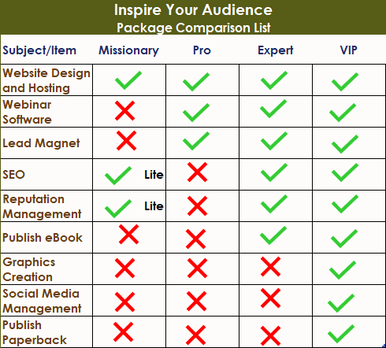 We've created a lower-level tier for you, enabling you a more affordable alternative to some of our packages, getting you more services aimed at your needs as a missionary or pastor. A website's important for missionaries who are overseas or going overseas. They need to give their supporters, future supporters, and those interested in their ministry, a chance to learn more about their ministry. SEO (Search Engine Optimization) goes hand-in-hand with this, getting more people to the website. Sometimes, people may write wrong things about missionaries online, since it's a Spiritual warfare that is happening, so we also provide a lite version of reputation management within this package. There will be alerts if your name appears somewhere on the Internet.